The workshop begins by watching a demonstration by a Chef Instructor, continues with a tasting and ends with a practical class. You will make one of the dishes demonstrated under the supervision of the Chef. All that remains is for you to dazzle your guests with your culinary prowess. You will spend time with a top class cuisine Chef in the very heart of Paris, renowned the world over for its gastronomy. The session takes place in a spacious, equipped kitchen to enable you to master classic recipes. Each participant has their own individual work station. You will be able to watch a renowned cuisine Chef make French recipes. After the demonstration, you will make one of the dishes demonstrated. 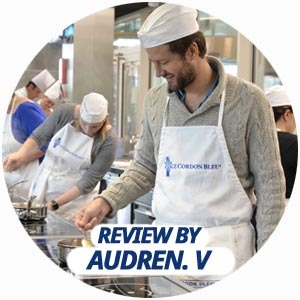 Under the watchful eye, and with the advice of, the Chef Instructor, you will learn to make the garnishes or sauces that go with the dishes, but also refined starters and desserts which will awaken your taste buds. This cuisine workshop will also enable you to experience life as a real Chef. At the end of The Art of Cooking like a Chef demonstration, you will be able to taste all the dishes made by the Chef. You can also take your dish home with you to taste with friends and family and astound them with your culinary expertise. We want The Art of Cooking like a Chef workshop to be an unforgettable experience for you. The culinary demonstration can be reserved separately (without workshop) at 50 € per person.